I think if I had to pick a quote to express how I think about myself, this might just be the one. I am a broken, frayed-edge, mistake-making human, who mostly means wells. Mostly. The same could be said for my prayer life. It is a bit of a mess, full of holes and unfinished seams and raw edges. Never finished and worn thin in places, but like that Velveteen Rabbit in the garden, it is real at last. Somewhere along the way in my early adult years I begin to discover that perhaps the problem wasn’t the what – intentional prayer – but the how. The light bulb began to come on for me in several ways. First I discovered the writings of Anne Lamott, Phyllis Tickle, and Brother Lawrence. I also discovered Yoga and the concept of Active Prayer. All of these discoveries together solidified the nagging thought that I had pushed down for long enough: I could pray. In fact I had always been praying. I also found that praying through activity – not just words – felt very meaningful and rich to me. Creating, moving, sharing, helping, – I found that these were all ways that I could pray. I found that I could pray prayers of petition, thanksgiving and intercessions by connecting the words of my prayers (silently or out loud) to intentional actions. This is something that I now try to impart to my kids – this idea that prayer doesn’t have to look a certain way or fit a certain mold to be authentic. That one can pray by playing make-believe or washing the dishes. That those prayers are just as valid as the ones we pray as a family at the dinner table, or the prayers that we say in church as a community each week. One of the ways I have begun to pray is through stitching. 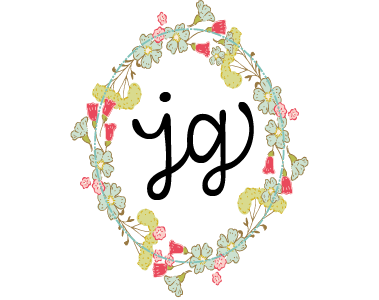 Through mending, and through embroidery. Very messy, homespun, frayed-edges sorts of projects. I have found that the act of intertwining needle, fabric, and thread can provide a wonderful rhythm for praying. When I mend I can pray for those whose clothes I am mending, or I can pray for the lives of those whose lives have been ripped apart like the hole in my ten-year old’s jeans. 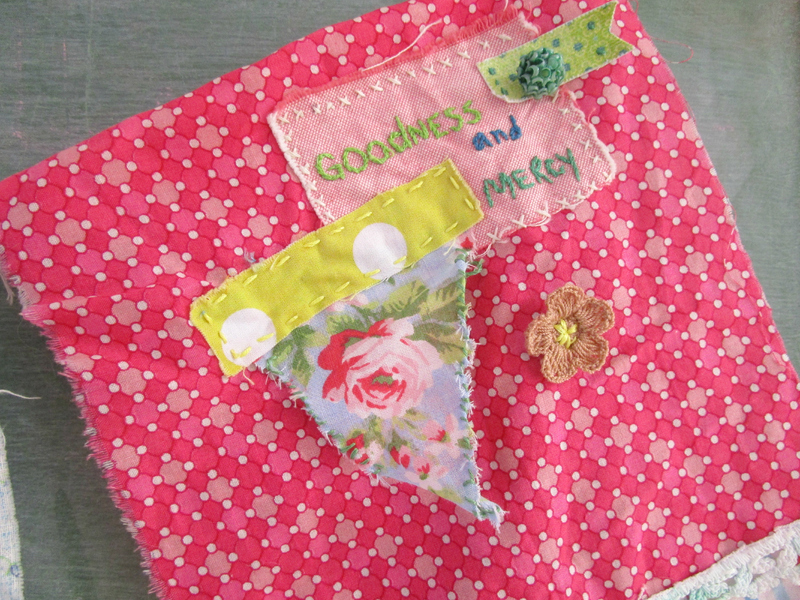 I have also discovered that I can tell stories through my stitching with words and textures, pattern and color, and that some of these stories can be used to create visual reminders to pray. Which is why I began stitching Prayer Flags. 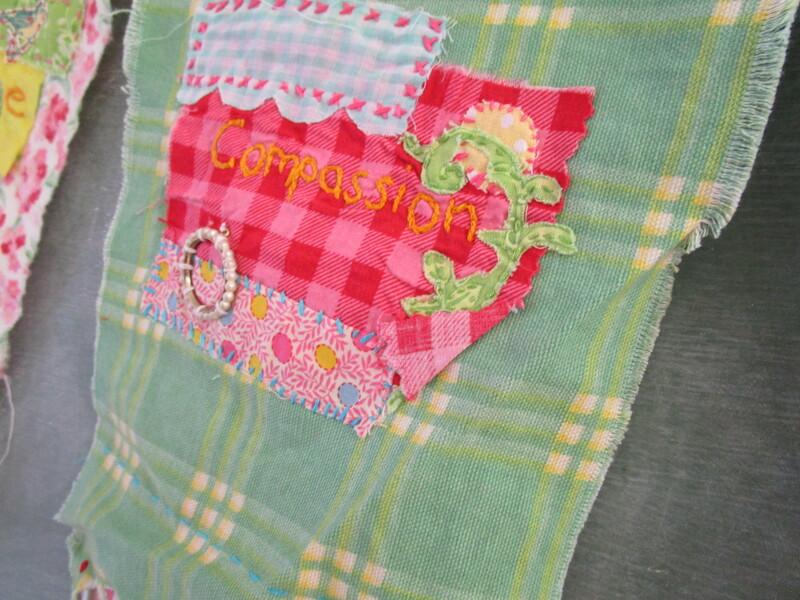 My Prayer Flag project all along has been inspired by the beautiful Tibetan Prayer Flags. I wanted to find a way to create something similar that we could hang in our home that would serve as a visual reminder of what we are to pray for, and to serve as a visual blessing over our home and all those who enter. And so I began to make my own prayer flags using leftover bits of fabric. In the year of so that I have been working on my flags, I found that this is a great way to teach the concept of active prayer. It is something that can be done in a crowded doctors waiting room, on the couch at home, in an airport, or at the park. I have also found that if I am going to whip it out around kids, I better be prepared to let them help or make their own. Despite (or perhaps because of) this age of technology and going fast, kids seem to be drawn to this slow craft. The idea that they can make words and pictures out of piles of string and scraps seems to touch a chord in almost every kid I encounter. Truly, any person who can hold a needle or write with a pencil can make these. And if your kids too young to do either, let them help by choosing the fabrics and colors. Encourage teens make their own set for their bedroom, or as gifts for friends. Watch this 2-year-old sing The Lord’s Prayer – learn to sing The Lord’s Prayer together! 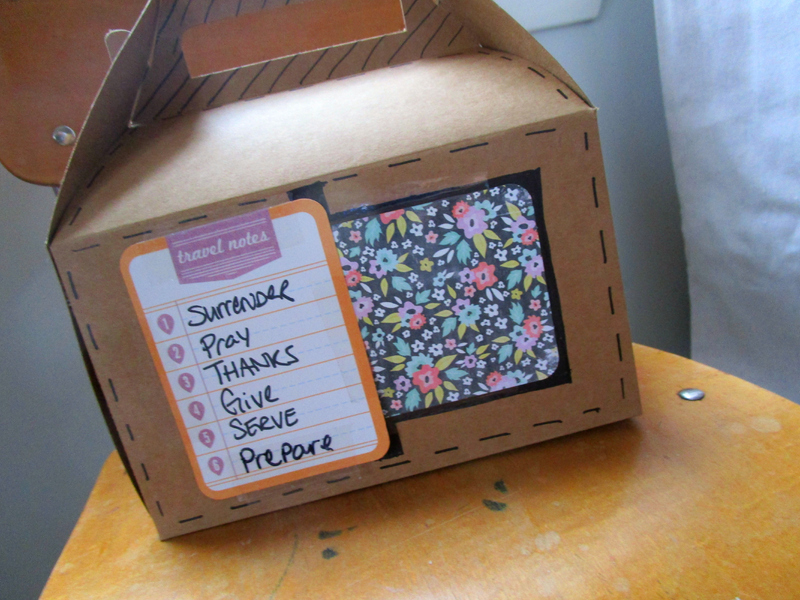 Are you creating A Family Lent box to keep tactile reminders of your Lenten practice in? If so, for this week ‘s theme Pray, discuss these three types of prayers as a family, then have everyone write/draw/create one prayer based on each type to add to the box. Want a little #HomespunHappy in your inbox from time-to-time? 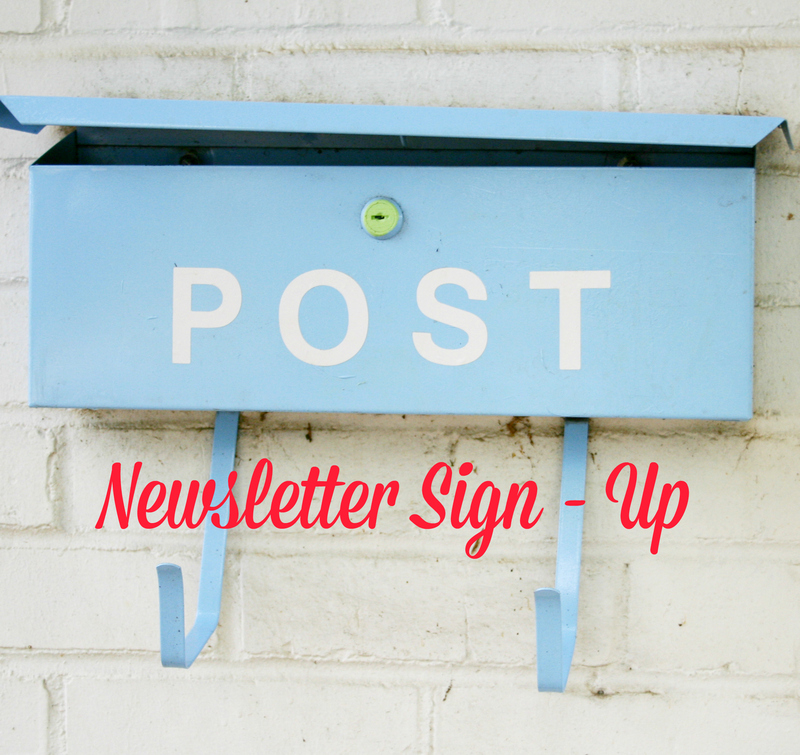 Sign-up for my new newsletter! *The Active Prayer series is published by my publisher Paraclete Press, however I have received no prompting or compensation from them for suggesting these books – I just really love this series! I love the idea of praying while doing. I’ve knitted prayer shawls as I prayed for those fighting for their health, their lives. It was a blessing to me and them. I like the idea of stitching and think I will do it. I used to cross stitch anything that sat still long enough. I love your charming craft ideas. I love your idea of stitching while praying. I’ve knitted prayer shawls while I prayed for people fighting for their health, their lives. It blessed me and them. Thanks for your charming ideas. This is so beautiful! I couldn’t agree more with the ups and downs and frustrations of my prayer life. 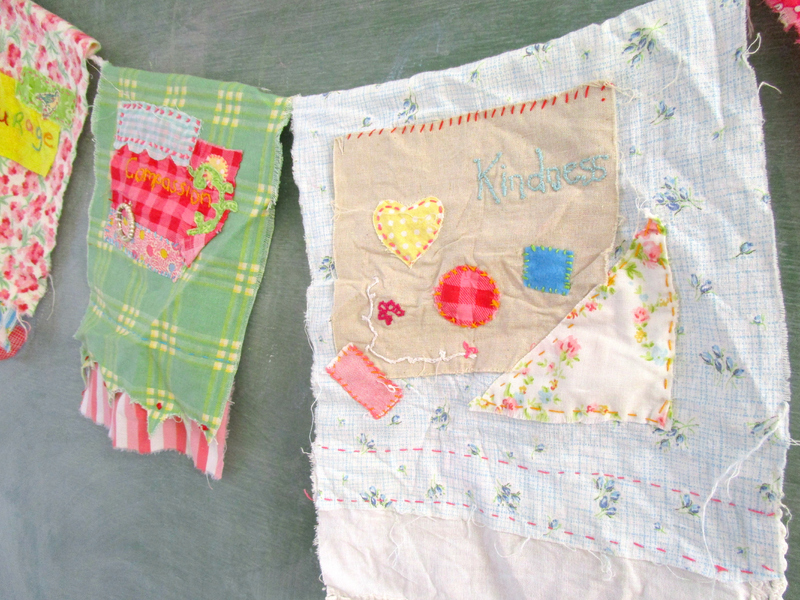 I love your approach to prayer and these prayer flags are absolutely adorable and perfect visual reminders. I LOVE this! Thanks for the inspiration, Jerusalem. I love to pray while I crochet. Can’t wait to try this.